Jumping cholla (pronounced “KOY-ya”) is native to North America. Identification: These cacti look more treelike, branching into irregular crowns. Stem segments are gray-green, eventually turning black, and spiny. The segments are 2-9" (6-23 cm) long and ¾-1¼" (2-3.5 cm) around. The areoles under each group of spines are triangular, with 0-18 spines per group. Spines are up to 1¼" (3.5 cm) long. They are yellow, but get darker with age. Flowers are pink to magenta. Fruits form long chains like teardrops attached to each other; each fruit is fleshy, green, nearly spineless, ¾-2" (2-5.5 cm) long. 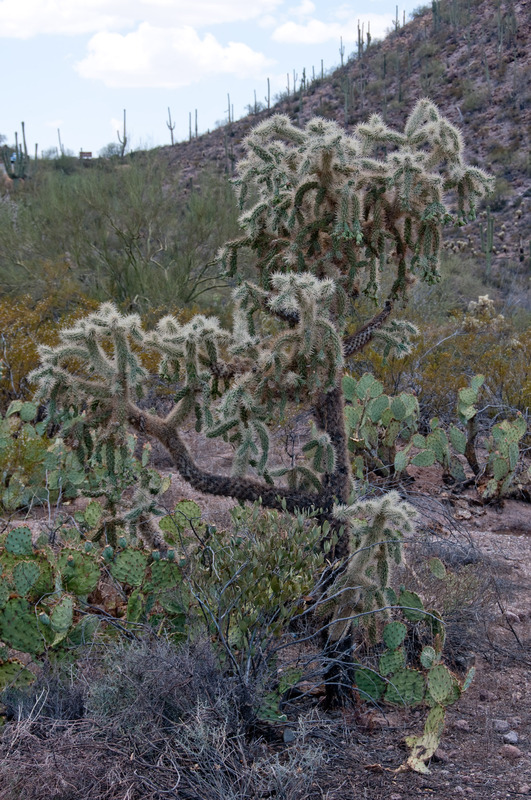 These cholla, like their cousins teddy bear cholla, have a reputation for launching attacks on unwary passers-by. I can personally attest to this, having found a good-sized clump embedded in the leather of my shoe. There are two reasons for this reputation. 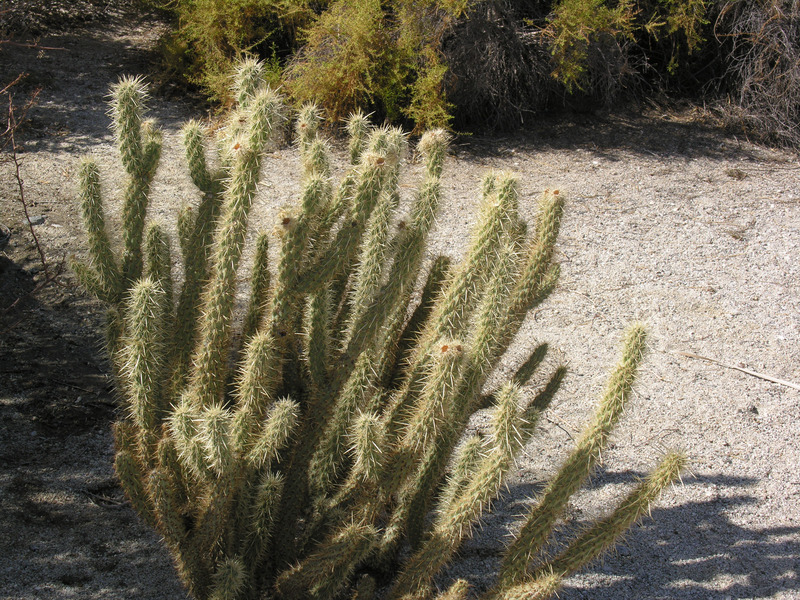 First, cholla have glochids, tiny groups of spines that detach easily and implant themselves into skin, causing immediate irritation. 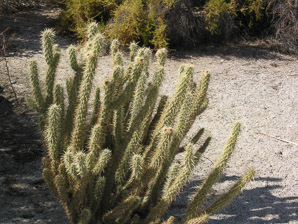 The second reason is that small portions of chollas routinely break off, littering the desert floor, attaching easily to passing victims, and growing new cacti wherever they end up. 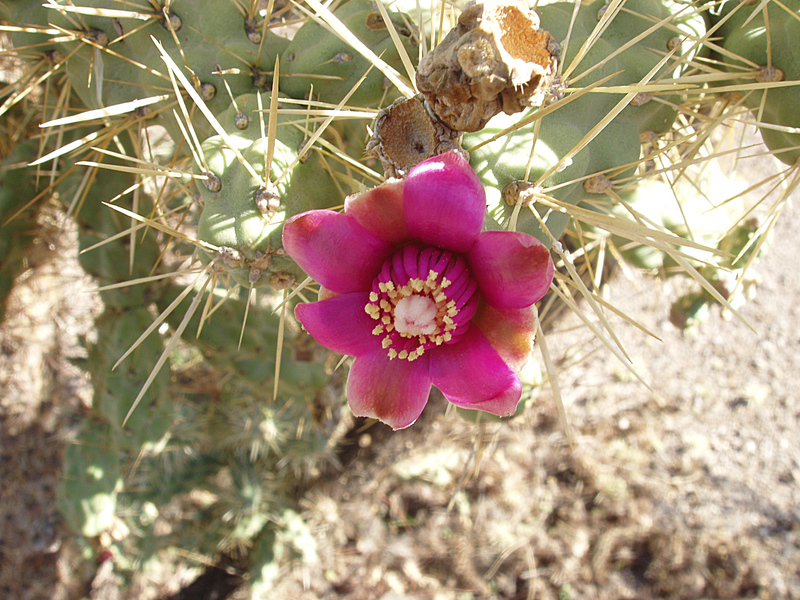 Flower of Cylindropuntia fulgida, Saguaro National Park, AZ, early August 2007. By NobbiP. 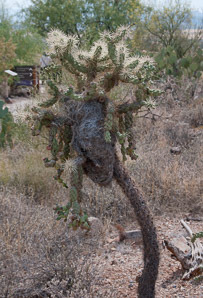 Cylindropuntia fulgida var. 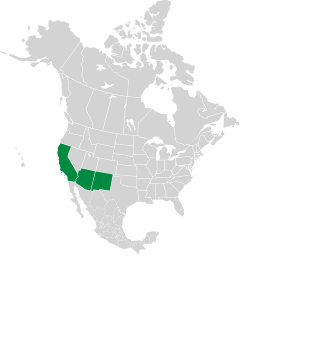 fulgida description by Thomas H. Kent, last updated 2 Jan 2019.